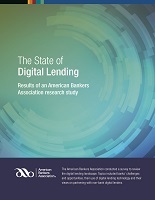 The State of Digital Lending highlights the results of a recent ABA survey of banks nationwide, examining how banks are taking advantage of digital lending, the challenges they face and where they see opportunities. This report also provides case studies on the innovative ways banks are leveraging digital lending to better connect with customers as well as grow their loan business. Interested in learning more about digital lending? View ABA Endorsed Digital Lending Solutions.